Richy’s bobblehead mask was taken from our show in Bridgeport, CT. This mask is a one of a kind piece that is an essential component to our live show. We have photos of the theft but rather than press charges we would prefer if the person who took it would get in touch with us to return it. 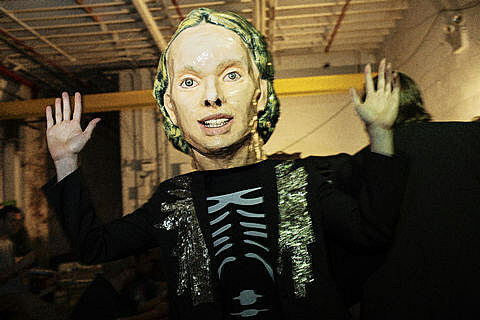 Perhaps this is all an innocent mistake and you meant to leave the venue with your own oversized paper mache rendition of Richard Parry’s head? Please contact: info@quest-management.com with any information. I hope they get it back. Meanwhile, check out pictures and the setlist from that very show (maybe one of those masked crowd members is the culprit! ).